Arnold trained Muay Thai for 1 month for fitness and fun. He enjoyed Phuket and and all the great beaches and attractions. Dao trains at the Thai boxing gym on a regular basis. 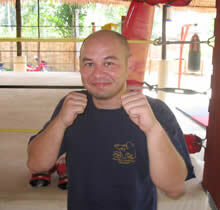 Dao is experienced in Muay Thai and lives in Phuket, Thailand. Dao trains hard and is an excellent female fighter. 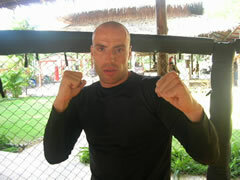 Many of our guests at Tiger Muay Thai & MMA Training Camp, Phuket, Thailand come from Europe. Muay Thai is quite popular in Finland, Sweden, France, Norway, and Germany. Familes can train together and see everything that Phuket has to offer our foreign guests. Many of our Muay Thai trainers are fighters as well. Here, Kroo Muay Thai Chawn, works with guests and prepares for his own muay thai fight. Chawn is an excellent trainer and good Thai Buddhist who has helped our camp on many occasions. 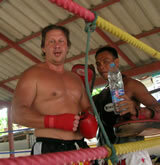 Many guests come to our training camp with experience in Muay Thai, MMA, and other Martial Arts. Female Muay Thai fighters enjoy being able to train and preapre for fights at our Thai boxing gym. 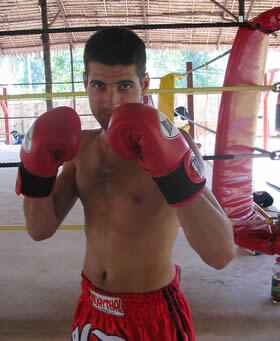 Many of our guests at our Muay Thai gym have trained and fought in Muay Thai matches in their own country. Muay Thai fighters and guests come from Australia and New Zealand to train trditional Muay Thai. No Muay Thai experience requited. Many of our training camp guests have no Martial Arts experience. Many of our guests training Muay Thai and MMA are from Scotland. Muay Thai is popular among guests with Martial Arts experience like Tae Kwon Do, Karate, Jiu0Jitsu, Akido, and Judo. Many TMT Phuket guests train Cardio Muay Thai to lose weight and better fitness at our Thai boxing gym. Even Movie starts and celebrities train Muay Thai at our Muay Thai gym and training camp. 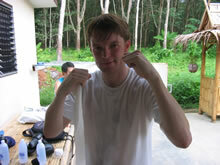 Many of our guests come from Singapore to train traditional Muay Thai. Sweden loves Muay Thai and also loves Tiger Muay Thai & MMA Training Camp, Phuket, Thailand. Each year, more than 50 guests from Sweden arrive at our training camp to experience traditional Muay Thai and MMA training in the tropics. Muay Thai is popular in Germany and training Muay Thai is available in Phuket, Thailand. Training Muay Thai in Greece is becoming popular, and many of our guests arrive into Phuket, Thailand from Greece to learn Muay Thai. Many guests arrive at Tiger Muay Thai and MMA from Singapore. Muay Thai guests come from Canada to train Muay Thai and MMA in the tropics. Some of our guests can train and party in Phuket like no others. Train Hard….Play hard. 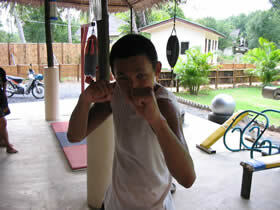 Allan has fought in 2 Muay Thai fights and 1 MMA fight while training for 3+ months in Phket, Thailand. 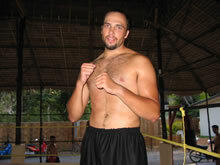 Chris is a Muay Thai fighter from Canada that trains @ our camp on a regular basis. 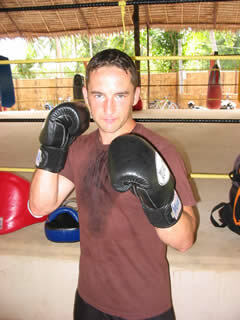 Chris has experience in kickboxing and martial arts in Canada. Blake “The Blade” Lirette is training at Tiger Muay Thai & MMA to prepare for his upcoming World title defense in Canada. Blake trains MT and MMA everyday and has learned to apply several skills that will help him in his title defense. 28 Years Muay Thai Experience. 5 Lumpinee Titles in 3 weight divisions. Train with some of the best fighters Thailand has to offer.